This lesson will teach you how to duplicate Lessons and Manuals. To duplicate a lesson simply select a lesson and choose Lesson > Duplicate Lesson. A complete copy of the lesson will be made. 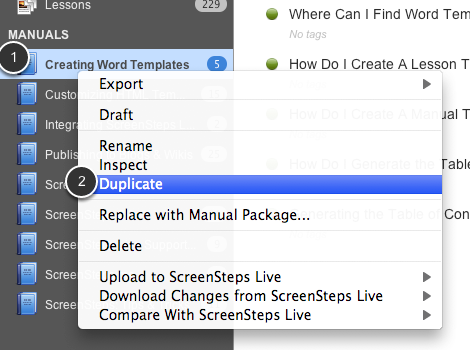 To duplicate a manual, right click (ctrl-click on Mac) on the manual and select Duplicate. You will be asked if you want to duplicate all of the lessons or just reference them. If you only reference the lessons then any changes you make to a lesson will show up in both the original manual and the duplicated manual. After you select an option the manual will be duplicated. 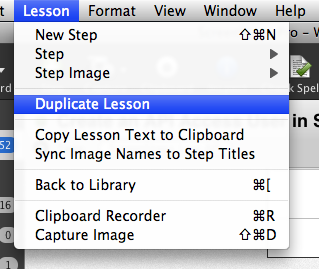 I love the new ability to duplicate lessons and not have them linked to the original.